What exactly is Hemorrhoid Freedom? How do I order your Hemorrhoid Freedom product? I have never purchased a product online before, what can I expect? 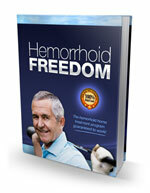 Is your Hemorrhoid Freedom book available in print? Why is Hemorrhoid Freedom not sold in stores? What exactly is Hemorrhoid Freedom ? Hemorrhoid Freedom is a 3-step system for treating hemorrhoids from the comfort of your own home. It is a program that you can instantly download to your computer after placing your order. .. and a lot more. Hemorrhoid Freedom was created to be an inexpensive internet-based program made available to people all over the world. It will show you how to treat hemorrhoids from the comfort of your own own and comes with a money back guarantee if you're not satisfied. How do I order your Hemorrhoid Freedom book ? Ordering the product is simple. Simply follow the directions on the home page and you will have immediate access to the product as soon as your order is complete. Many people have never purchased a product online and are unsure about what to expect. Hemorrhoid Freedom: The 3-Step Hemorrhoid Home Treatment Program! is an electronic book (an e-book) that you will be able to download immediately after successful completion of your purchase. You will be given clear directions at each step of the ordering process. The transaction is processed by Clickbank, which uses the same level of security as online banks. Your credit card and personal information is safe with Clickbank! If you have any problems when placing your order, please feel free to contact us for help. No. Due to the costs associated with printing and shipping products, Hemorrhoid Freedom: The 3-Step Hemorrhoid Home Treatment Program! is not available in print. By delivering this book electronically over the internet, we can keep our costs down and you can get your solution instantaneously! You are also free to print yourself a copy on your home computer if you like. Simply because of cost. It is very difficult, expensive, time-consuming, and inefficient to physically publish and distribute step by step guides like Hemorrhoid Freedom . It costs tens of thousands of dollars to create and distribute books and only a tiny fraction of the profits go to the author of the book. Everything is going digital, including music, movies, and books. It is much easier for products like this to be distributed digitally and it also allows for us to update the book at the touch of a button, rather than printing different editions as time goes by. If your questions was not answered here, please see the contact page.